Cover: The Heath Hen sculpture is part of The Lost Bird Project which seeks to create awareness about our fragile bird species. The creation of artist Todd McGrain, the project has been sponsored by the Smithsonian and other organizations. Four bird sculptures will remain in the Haupt Garden until spring 2015; a fifth bird is in the Urban Bird Habitat at the National Museum of Natural History, on the corner of 12th Street and Constitution Avenue. Landscape Progress Smithsonian Gardensâ&#x20AC;&#x2122; landscape architect, arborist, and supervisory horticulturist worked closely with landscape contractors and representatives from the landscape architect firm GGN to select 106 specimen trees from 7 nurseries in four different states for the National Museum of African American History and Culture project. Carefully chosen for optimal habit, form, health, and vigor, these trees will be installed in the fall of 2015 as part of the permanent planting scheme of the museum. A corn poppies (Papaver rhoeas ‘American Legion’) program was created to commemorate the 100th anniversary of World War I. The red flower has become an international symbol of remembrance of those who have died in war. Local U.S. Marine Corps volunteers were part of the planting; they helped horticulturists sow the seed mixture over the south lawn of the National Museum of American History in an ongoing effort to interpret American history through plants. The expectation is that these poppies will bloom to coincide with Memorial Day 2015. 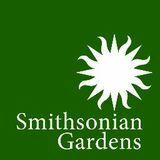 In April, Smithsonian Gardens was granted approval to implement a no smoking policy in several gardens. The Haupt, Ripley and Folger Rose Gardens now join the NMAI landscape and the National Zoological Park in broadening no smoking to exterior spaces. 2014 brought an enormous challenge to the interior plant staff of Smithsonian Gardens: the replacement of two 25-foot black olive trees and one 35-foot Ficus rubignosa in the Robert and Arlene Kogod Courtyard of the National Portrait Gallery and the Smithsonian American Art Museum. This 10-day operation involved a phenomenal amount of coordination with the Museums’ staff, facilities staff and contractors. 908 cubic feet of soil along with the existing plantings were removed and planters were inspected for leaks. Three new black olive trees and 180 understory plants were reinstalled. First Gardening Book Smithsonian Gardens supported this year’s Folklife Festival by providing guidance on the initial site plans, supplying tropical foliage plants for the Kenya and China programs, managing the restoration of the Marketplace site at NMAH, and providing equipment that was used to maintain the National Mall site during the duration of the festival. Folklife Festival Smithsonian Gardens has been noticing some unexpected garden tourists lately, thanks to an influx of geocachers to the Butterfly Habitat Garden at the National Museum of Natural History. Geocaching is a popular hobby in which participants follow online clues and GPS coordinates to find “caches” where they can log their visits. Thanks to a hidden cache near Smithsonian Gardens’ oldest living collection item, an Elm tree that predates the Natural History Museum, geocachers have found themselves unexpectedly immersed in garden spaces and have enjoyed the opportunity to learn more about American Elms. Modern Day Extinction The Lost Bird Project recognizes the tragedy of modern extinction by immortalizing North American birds that have been driven to extinction. To date, bronze memorials have been dedicated to the Passenger Pigeon, Carolina Parakeet, Labrador Duck, Great Auk, and Heath Hen. These sculptures compel us to recognize the finality of our loss. They ask us not to forget, and they remind us of our duty to prevent further extinction. Extinction of animals, plants, and other organisms caused by human actions can often be credited to habitat destruction resulting from deforestation and pollution. Excessive hunting and fishing, the introduction of non-native species, and the transmission of diseases are also contributing factors. Smithsonian Gardens staff played an integral role in The Lost Bird Project sculpture installation as well as the exhibit design and implementation. The sculptures arrived on a cold morning in March, wrapped and staged on a flatbed truck. SG staff assisted with moving the sculptures via a forklift, excavating the planting beds in the gardens to receive the sculptures (which were attached to an I-beam support system) and re-creating the beds around the newly installed sculptures. SG staff also designed the interpretive signage in-house, contracting for its fabrication, but accomplishing the installation in-house as well. Finally, SG put together a mobile phone tour, using narratives from the sculptor, so that visitors could hear first-hand about the history of these birds as well as the artistic process employed in the creation of these stirring artworks. trengthening its commitment to environmental management and sustainability, Smithsonian Gardens has joined Audubon International’s Cooperative Sanctuary Program. This educational and certification program designates a high level of environmental stewardship. To become certified, Smithsonian Gardens staff developed, implemented, and documented the results of an environmental management plan in 5 key areas:  Site assessment and environmental planning  Wildlife and habitat management  Water conservation  Resource management  Outreach and education Certification was achieved by SG after demonstrating that it met (or exceeded) Audubon International’s environmental management standards in all five areas. Smithsonian Gardens had already implemented several management practices required for certification including using water conservation technologies, recycling, composting, implementing an integrated pest management program, and educational training, so meeting the criteria set forth by Audubon was an obtainable goal. Working with Audubon International will help Smithsonian Gardens find new projects to enhance its urban wildlife habitat and conserve natural resources. Food in the Garden Smithsonian Gardens and the National Museum of American History co-hosted another highly successful Food in the Garden series in the Victory Garden. FOOD in the Garden 2014 explored four maritime regions where battles were waged during the War of 1812: Long Island Sound, the Chesapeake Bay, the Great Lakes, and the Gulf of Mexico. In continued celebration of the Star Spangled Bannerâ&#x20AC;&#x2122;s 200th anniversary, 200 years of connections between land and water, and people and food provided topics of conversation for attendees while they enjoyed food and drinks in a relaxed garden atmosphere Thursday evenings in September. Over the course of five weeks, more than 600 participants attended weekly evening panel discussions, thematic demonstrations, and garden tours. The program was made possible by the generous support of DuPont Pioneer, The Julia Child Foundation for Gastronomy and the Culinary Arts, and Wegmans. Collections In April, the Smithsonian Gardens Orchid Collection (SGOC) went live on the Smithsonian Collections Search Center (CSC). The Smithsonian CSC is an online catalog containing thousands of Smithsonian collections from our museums, archives, libraries, and research units. There are 8.1 million catalog records relating to areas for Art & Design, History & Culture, and Science & Technology with 860,477 images, videos, audio files, podcasts, blog posts and electronic journals. SG’s 8,433 orchid specimens comprise the first living collection to join the multitudes of objects, specimens, and archival records that are contained within the site. SGOC records contain basic information about each accession such as scientific name, flower color, range, taxonomy, and available photos. SGOC’s presence on the Collections Search Center has served as motivation to improve the quality and completeness of SGOC collection records in BG-BASE and correct plant identification errors. The hope is that these online records can be a resource for educators, students, researchers and curious individuals, and a source of orchid inspiration year-round. Share Your Story As part of a new social media project, Smithsonian Gardens launched an exciting initiative by the name of ‘Community of Gardens’ that seeks to capture garden stories online. Everyone is welcome to add their own garden story to the site. Orchid Collection Smithsonian Gardens’ terrestrial orchids received quite a boost in numbers. Collection managers Tom Mirenda and Sarah Hedean acquired Paphiopedilums and Phragmipediums. They found many valuable additions for the collection, including a blooming-size Phragmipedium kovachii and several associated hybrids. We will hopefully see these spectacular kovachii flowers within a year. Additional Phragmipediums were obtained, including Phragmipedium brasiliense, Phragmipedium boisserianum and Phragmipedium sargentianum. All three species are new to the collection. Tree Collection A complete tree risk and health assessment was performed on every tree in the collection at all of Smithsonian Gardens’ downtown locations. This generated a priority list of the maintenance and special monitoring needs for each tree. Assessments were started at the Anacostia Community Museum and at the Smithsonian’s support facilities in Suitland, MD. In May, the Smithsonian, the Deputy Under Secretary for Collections and Interdisciplinary Support, and the Smithsonian Collections Emergency Management Working Group recognized Smithsonian Gardens for its emergency preparedness involving the tree collection. Greg Huse graduated from the University of Vermont with a Bachelor of Science in Forest Resource Management. He started his career as a consulting forester in New Jersey, then joined Bartlett Tree Experts and later SavATree in Connecticut. In 2007, Greg took a sabbatical to thru-hike the Appalachian Trail for six months. In 2011, he joined Smithsonian Gardens as its Arborist & Tree Collection Manager with Smithsonian Gardens. undreds of letters written in 1924 in response to a “What Burpee’s Seeds Have Done for Me” contest that are included in the W. Atlee Burpee & Company Collection at the Archives of American Gardens were scanned and uploaded to the website resource, Smithsonian Transcription Center. ‘Digital volunteers’ transcribed the handwritten and typed letters so that they can be more easily searched and accessed for research purposes. An invaluable resource, the letters tell stories by and about the average home gardener in the U.S. during the first quarter of the 20th century. H E L P S O LV E A M YS T E RY ! Archives of American Gardens’ holdings include over 100,000 images of historic and contemporary gardens. These images come from literally thousands of different sources and were not always accompanied by basic information (such as owner or location) that would identify them. Without this fundamental data, these images lose much of their informational value. To date, scores have been identified, but a staggering amount still need information. The orchid collection staff is working with the North American Orchid Conservation Center to determine the best growing techniques for endangered native orchids such as Cypripediums and Platanthera. Earlier this year staff members travelled to several sites to collect mycorrhizal fungi from wild populations for extraction, identification, fungal banking, and eventual use for seed germination and nutritional enhancement of cultivation beds in the future. Grants Smithsonian Gardens is grateful for continued support from the Smithsonian Women’s Committee, which came this year in the form of a second grant to fund additional work in the Urban Bird Habitat. This year’s grant funded the expansion and completion of the garden and the addition of interpretive signage. Phase II garden enhancement included the planting of over 30 native trees and countless native shrubs and perennials to add multi-season interest and important habitat components for migratory and native D.C. birds. The completion of Phase II also connected the endcaps of the garden, thus providing contiguous habitat along the entire south and west sides of the National Museum of Natural History. Hundreds of garden slides (see below) dating from the 1950s and 1960s taken by Garden Club of America (GCA) member Adelaide Pratt of the Chestnut Hill (MA) Garden Club were donated by the GCA Archives to the Archives of American Gardens (AAG). Garden designer Lois W. Poinier donated a scrapbook of images documenting her and her mother’s own gardens in New Jersey. The images span several decades and show in great detail how the gardens evolved over time. The scrapbook has been added to the Lois W. Poinier Collection already at AAG that includes images of Mrs. Poinier’s design work and historic glass lantern slides used for lecture purposes. Garden designer Mary Riley Smith donated her collection of design files to AAG. Her work includes numerous rooftop gardens in Manhattan as well as public spaces such as St. John the Divine and the Colony Club in NYC. Her 1992 book, The Front Garden: New Approaches to Landscape Design, features several of her designs. SG welcomed Matt Burch as its new horticulturist at the Hirshhorn Museum and Sculpture Garden. Matt comes to us by way of the National Park Service where he was a gardener at the White House, working primarily in the First Lady’s vegetable garden. Matt also owns an organic farm in the Winchester, VA area. Additionally, Matt served in the United States Marine Corps, and has a Bachelor of Science degree from West Virginia University with a major in Horticulture and a minor in Floriculture. In December, AAG staff received the Smithsonian Secretary’s Awards for Excellence in the Digital Enterprise category along with five other units who were all part of a Rapid Capture Pilot Team coordinated by SI’s Digitization Program Office. According to the citation, “This group enhanced the ability of the Smithsonian to digitize collections efficiently and share them with the world. Rapid capture projects optimize physical and digital workflow by harmonizing speed with object safety and quality imaging. These projects have demonstrated a dramatic increase in productivity.” Jeff Schneider, Grounds Manager, was recognized as a 2014 Employee of the Year by the Director of the Office of Facilities Engineering and Operations (OFEO). Jonathan Kavalier, Supervisory Horticulturist, completed the Certified Grounds Manager (CGM) program, developed by the Professional Grounds Management Society. It is the premier program of its type in the Green Industry. Sarah Hedean and Jonathan Kavalier completed the Smithsonian’s Emerging Leader Development Program, a pilot mentorship program to develop rising stars in the Institution. Sarah Hedean, Vickie DiBella, Tom Mirenda and Cheyenne Kim received a 2014 OFEO Director’s Employee of the Year award in recognition of their work on achieving NAPCC certification for the Smithsonian Gardens Orchid Collection. Brett McNish, Supervisory Horticulturist, received the National Museum of American History’s Rodris Roth Memorial Prize for his peer lecture at the Conference on Salt. 20 Years of Appreciation In 1994 Smithsonian Gardens (then the Horticulture Services Division) joined forces for the first time with the horticultural institutions, public gardens and arboreta in the Washington Metropolitan Area to honor our most valuable resource, our volunteers. During National Volunteer Week in 1994, a special day at the U.S. National Arboretum was organized to thank the many volunteers who donated countless hours supporting our institutions and programs. 2014 marked 20 years of this collective celebration of our public garden volunteers. This momentous occasion was once again marked by an Appreciation Day held at the U.S. National Arboretum in Washington, D.C. “20 Years of Celebrating Volunteers” was organized by the Horticultural Consortium of the Greater Washington Area, which invited our volunteers from D.C. area public gardens for an evening of good food, presentations, tours, door prizes and fun. The enthusiasm and dedication of this most valuable resource—our volunteers—inspire the Institution, staff, and visitors each day. Smithsonian Gardens couldn’t achieve what it does without the support of our volunteers. We look forward to celebrating the next 20 years with this devoted and talented group of individuals! Voted a â&#x20AC;&#x153;Top 10 Science Museums Instagram accounts to followâ&#x20AC;?